Our Secret Meaning of Flowers series continues today with a look at Irises, a flower which has a multitude of different meanings in different cultures. The colour of the flower itself can also shade the nuance of the significance behind sending irises to a loved one. For example, the purple iris is thought to symbolise wisdom and sagacity in some regions or royalty in others. Yellow irises represent passion, so could be used in a romantic context whilst white irises, as seems to be the case with many white flowers, signify purity. In ancient times, irises were thought to have been planted over women's graves to summon the Greek Goddess Iris, the messenger of the gods, who acted as the link between heaven and earth. Drawings of irises have also been discovered at a number of Egyptian palaces, indicating the high regard in which they were held. The iris is also a widely recognised symbol of France - the popular Fleur-de-lis symbol can be observed across the world. This association has existed since the middle ages when the flower was linked to the French monarchy. The primary associations of the iris flower are said to be faith, hope, courage, wisdom and admiration. These connotations make irises well suited as get well soon or sympathy flower bouquets to send to a loved one. Irises are also said to represent eloquence, valour and friendship. The varying meanings behind irises make them very versatile indeed as a gift for different occasions. Irises feature heavily in many of our bouquets, whether as the main 'ingredient' or arranged amidst other types of flower. 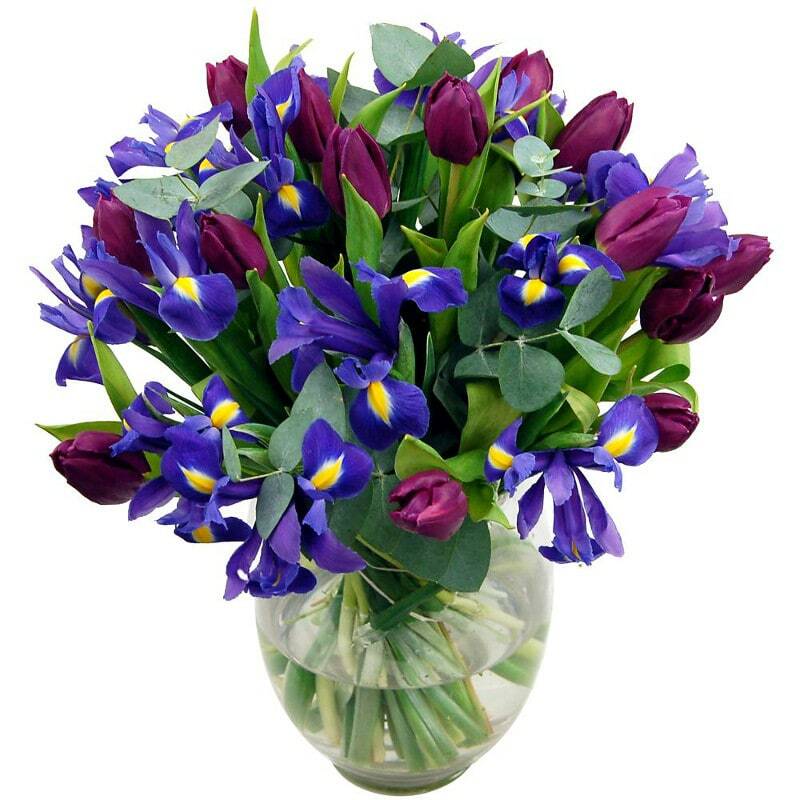 Our elegant Midnight Iris bouquet boasts a splendid blend of rich blue irises and deep purple tulips. Poetically described as "waves lapping on a deserted beach at dusk" and "the heady scent of midnight in a summer garden, when flower-petals reach up towards the moon," this resplendently radiant bouquet is sure to put a smile on the face of that special someone.